Provides a revealing global overview of air pollution and its startling impact through graphical and visual representation of data. Air pollution affects us all in a number of crucial ways, causing lasting damage to our health and our environment. Whereas primary pollution can result from local activities, the extent of the impact can be felt at spatial scales from the individual up to the whole planet, and temporal scales from minutes to decades. Consequently, pollution of our atmosphere remains a critical concern, warranting continued scientific investigation and the development of effective local and global solutions. ‘The World Atlas of Atmospheric Pollution’ clearly and engagingly summarises current understanding of the state of air pollution on city to global scales. Using high-quality graphical illustrations, the Atlas begins with a historical perspective before addressing topics such as urban and global air pollution, long-range transmission of pollution, ozone depletion and the impacts of air pollution, as well as future trends. Each chapter provides an introduction to the topic and graphical representations of the spatial and temporal distributions of air pollutants. 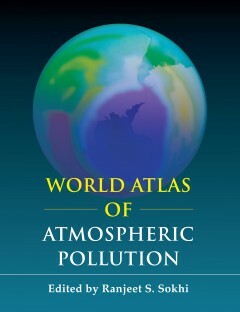 Wherever possible, the chapters give a world-wide view of the state of our atmosphere. The illustrations are supported by explanations and other background material, allowing the reader to gain an informed insight into emission sources, the resulting atmospheric concentrations of key pollutants and their associated impacts.